This experience is perfect for both hotel and cruise guests. The lovely beach allows you to enter slowly and, as it is shallow, you will always be able to stand and retain your balance. This venue seems like it was designed particularly for young children. Usually the action of the stingrays can surprise you, but here the shallow water allows children to sit on the sand and watch until they feel comfortable enough to enter the water. These are happy animals and you will have snorkel gear which may allow you to see their smiles, as their mouths and nostrils are on the bottom side of their bodies. While you are within the enclosed area of the beach, your gear is included in the cost. You may visit with the stingrays as long as you wish. You can visit the area where the babies are kept and also watch the trainers feed the stingrays en masse. When the stingrays have finally exhausted you, you can enjoy the public beach area on the island. There is a grill if you are hungry or thirsty and lounge chairs are available for your use. You may rent either a float mat for $15 or snorkel gear for regular beach snorkeling after your stingray experience for $10. No Taxi Required - Specific pick up or taxi instructions will appear on your voucher after you purchase your trip. Wear your swimsuit and bring a towel, sunscreen, a hat, extra t-shirt and your camera. You might want to bring some money for a snack or souvenir. Please do not confuse this adventure with Stingray City on Grand Cayman. 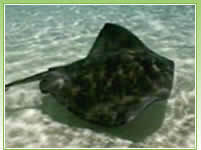 These stingrays are de-bobbed and in a protected area, rather than the open-water setting on Grand Cayman. There is no taxi required for cruise ship passengers. If you are staying at a hotel, a transfer will be required. When purchasing, please enter the number of children under age 3 who will be on the trip. There is no charge for these children.